The Big Flood. On September 30, 1949, heavy rains in the Sandia Mountains sent flood waters rushing toward Bernalillo. 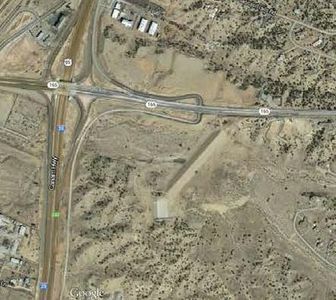 Interstate 25 did not exist then and there was nothing to stop the waters. Most of the town was flooded and a 100-year-old convent and several homes were destroyed. Some residents had to be rescued. In the aftermath, the main road was closed, rail service was interrupted, and an enormous mess was left to be cleaned up. --Monthly Review of Weather, September 1949, US Weather Bureau. Bernalillo had experienced flooding before, but the 1949 event was especially severe. It was clear that to prevent future floods, a flood control dam was needed. A Dam is Born. On March 18, 1955, the Santa Fe-Sandoval Soil and Water Conservation District, now the Coronado Soil and Water Conservation District, entered into an agreement with the Felipe Gutierrez Grant Corporation for a tract of land on which to build the dam. That same year, the District signed an easement agreement with a local landowner to permit access to the dam site. The dam itself––the Sandia Mountain Tributaries Site 1 Flood Control Dam, also known as the Piedra Lisa Dam––was constructed by the USDA Natural Resources Conservation Service. Its construction was made possible by a congressional initiative to install hundreds of flood control dams throughout the country. The Piedra Lisa dam was completed in the late 1950s. The Piedra Lisa Dam is located in the southeast corner of the intersection of NM 165 and I-25.